By now, you’ve likely seen the viral video of a member of the illustrious Queen’s Guard taking a timeout from the tedium and seriousness of his back-and-forth marching to break into dance (if you haven’t been graced with the subtle awesomeness that is this video, it’s included below). 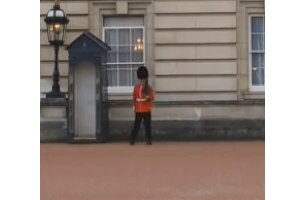 Since the red-coated guards of Buckingham Palace are famously stern and aren’t even supposed to crack a smile — let alone bust a move — the fleet-footed, lighthearted guard has become something of a YouTube sensation, bringing mirth and giggles to millions. But England’s Ministry of Defense isn’t laughing. Now that the guard has been identified publicly as 20-year-old Samuel Jones, his friends and family worry that the powers that be will make an example of him in an effort to prevent similar shenanigans in the future. The possible penalties could include a £1,000 fine, a loss of privileges, and even a three-week prison sentence. Though a Ministry of Defense spokesperson told The Evening Standard last week it was unlikely that Jones would be jailed, he also made it clear that the guard certainly isn’t getting off scott free: “He will face some sort of action but it is more likely to be a fine. No decision has been made,” the representative said. We understand, of course, that every military has rules that are meant to ensure safety and security, and that breaking those rules by letting one’s guard down — even for a moment of happy-footed-frolicking — needs to be discouraged, but no one likes a humorless disciplinarian; a slap on the wrist and a strong suggestion that he do all future pirouettes on his own time may be sufficient in this case.